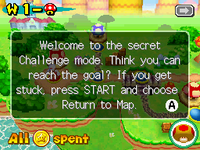 This article is about the mode from New Super Mario Bros.. For other uses, see Challenge Mode. —In-game text, New Super Mario Bros. The dialogue box, when Challenge Mode is enabled. Challenge Mode is a harder mode in the game New Super Mario Bros.. It has a few different block locations and does not allow the player to scroll the screen backwards, similar to the older Mario games such as Super Mario Bros. and Super Mario Land. Challenge Mode can be accessed in the start menu after finishing the game by pressing the following buttons: , , , , , , , . It can only be activated when the player has beaten Bowser in World 8. In terms of screen-scrolling, there are some exceptions. If Challenge Mode is enabled on a level that requires the player to go backwards, the screen will not scroll up instead. If it is enabled on a level where the player must move in all directions, the screen will scroll normally. The levels that cannot be played in Challenge Mode at all include World 2-3, World 5- , World 5- , World 7-7, and World 8- . Challenge Mode can cause several glitches in the game. For example, if the player jumps in the small space between a wall and the left edge, the player will float. If the player repeatedly jumps and wall jumps from that location, the player can go over certain parts of each level. If there is a ceiling above the player while doing so, the player will get stuck in the ceiling and be pushed away from it. This page was last edited on April 18, 2018, at 18:11.